Martinez Studio’s weaving “Tronco” – designed by Sandra Martinez and woven by Wence Martinez – has earned an Award for Excellence in Fibers for wall or floor work, and they will be profiled in the winter 2019 edition of Fiber Art Now magazine. The work rose above a pool of several hundred entries judged by three jurors to gain admittance into Excellence in Fibers IV, an annual exhibit that showcases the best in contemporary fiber art in the wall or floor, installation, sculptural, vessel/basketry and wearables categories. 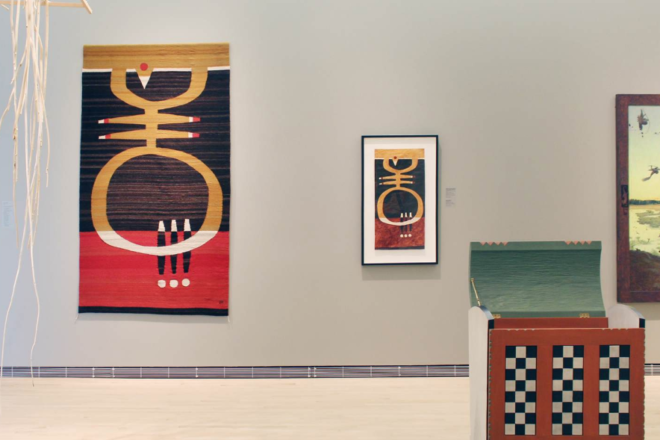 Wence Martinez’s weaving “Ojo de Agua” was also one of 15 works chosen for exhibition at the Craft in America Center in Los Angeles May 11 – July 6. For more information, visit martinezstudio.com.